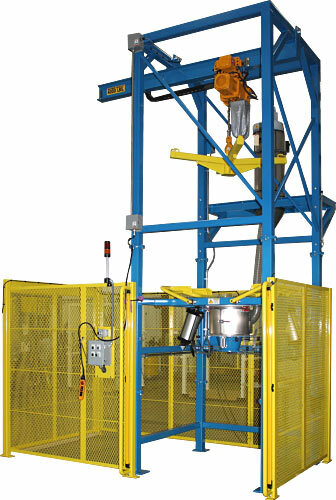 Includes exclusive Spider-Lift™ bag lifting frame. Safety caging on all four sides with interlock doors on the bag load side and a light curtain on the bag spout access location. Unit includes a pneumatic lockout valve and an emergency stop located outside the safety caging. Includes a 12” to 8” diameter tapered stainless steel product discharge transition with flanged outlet. Aluminum Seal-Master™ 18” dia. bag spout access chamber enables optimal operator access to bag discharge spout. Bag spout access chamber includes safety interlock door switches. Carbon steel Sure-Seal™ pneumatic bag spout clamping system seals bag discharge spout to outlet transition for dust-tight discharge. NEMA 4 operator control stations. Integrated dust filter system with heavy-duty mounting support and steel collection drum.